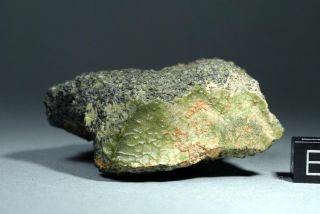 This green meteorite that landed in Morocco in 2012 could be from Mercury. Scientists may have discovered the first meteorite from Mercury. The green rock found in Morocco last year may be the first known visitor from the solar system's innermost planet, according to meteorite scientist Anthony Irving, who unveiled the new findings this month at the 44th annual Lunar and Planetary Science Conference in The Woodlands, Texas. The study suggests that a space rock called NWA 7325 came from Mercury, and not an asteroid or Mars. NWA 7325 is actually a group of 35 meteorite samples discovered in 2012 in Morocco. They are ancient, with Irving and his team dating the rocks to an age of about 4.56 billion years. Irving is an Earth and Space Sciences professor at the University of Washington and has been studying meteorites for years. But the NWA 7325 meteorite is unlike anything found on Earth before, he told SPACE.com. Meteorites from Mars are imbued with some Martian atmosphere, making them somewhat simple to tell apart from other rocks. Space rocks from Vesta, one of the largest asteroids in the solar system, are also chemically distinct, but NWA 7325 does not resemble any space rock documented by scientists today. Irving thinks that the meteoritewas created and eventually ejected from a planet or other body that had flowing magma on its surface at some point in its history. Evidence suggests that the rock could have been formed as "scum" on the top of the magma, Irving said. NWA 7325 has a lower magnetic intensity — the magnetism passed from a cosmic body's magnetic field into a rock — than any other rock yet found, Irving said. Data sent back from NASA's Messenger spacecraft currently in orbit around Mercury shows that the planet's low magnetism closely resembles that found in NWA 7325, Irving said. Messenger's observations also provided Irving with further evidence that could support his hypothesis. Scientists familiar with Mercury's geological and chemical composition think that the planet's surface is very low in iron. The meteorite is also low in iron, suggesting that wherever the rock came from, its parent body resembles Mercury. While Messenger's first extended mission just finished, the team has put in a request to continue researching the planet with the orbiter for the next two years. If the mission is extended until 2015, the science returned by the spacecraft could help further validate or invalidate Irving's ideas about the origin of the meteorite.Although finding meteorites on Earth that came from Mercury is less likely than finding Martian meteorites, it could be possible, Irving said.